When I was a child I couldn’t understand why a large part of the world lacked essential food and clean water – and were frequently starving – while the rest of the world were either dieting like fiends or noshing on exotic food stuffs in fancy expensive restaurants. I find the epicure section in my newspaper comedic. Once a week food writers present the findings of their research into all the latest nosheries, bars, cafes and food trucks. Anything that is new and innovative is talked up – even if it means paying through the nose to dine off chunks of blackened cauliflower, whilst sitting under the bare light globes of a re-purposed railway station. Celebrity chefs are lauded for their recent excursion into personal health and wellness and treated with the utmost respect. Some chefs have dramatically halved their weight and are photographed working out at a gym or shadow boxing. The dark, moody photographs of sweating chefs provide the illusion that they are tough noir film characters. Chefs who are on record as disparaging vegetarian menus are now ‘embracing ’ their inner vegan. Instead of getting rat-faced at the end of service, they’re now sipping Matcha tea before heading home for an early night. And so it goes. The hedonistic days of Anthony Bourdain and his band of piratical chefs staying up all night to partake in debauchery, blotter acid, cocaine, Stoli, heroin and Cristal champagne are long gone. These days even folk who eat at home are desperate to refine their culinary intake. I enjoy the weekly column of Richard Cornish in the AGE newspaper, answering emails from aspiring cooks. There are questions about cakes that fail to rise to the occasion, jams that refuse to set and dodgy eggs that ruin the Sunday brunch. Recently there was a home cook who’d been publicly shamed at a suburban BBQ when her onions blackened and turned dry. Cornish soothingly advised her to keep the flame low, heap the chopped onions into a pile and moisturize the onions like mad. Cornish has some followers who feel a desperate need to challenge his advice or berate him over what they perceive as an appalling oversight. Usually they’re wrong. But to his eternal credit, when the reader is right, Cornish publishes the critical letter and his response. Cornish has a marvellous sense of humour as did the late food writer/journalist AA Gill. Adrian Gill’s cutting wit, naked honesty and beautiful prose make his writing a real treat. In his biography, Pour Me: A Life, Gill writes about his wild ride into food criticism and his early days at British society magazine, Tatler. Gill strongly makes the point that he wasn’t wasting the years prior to succeeding as a writer. 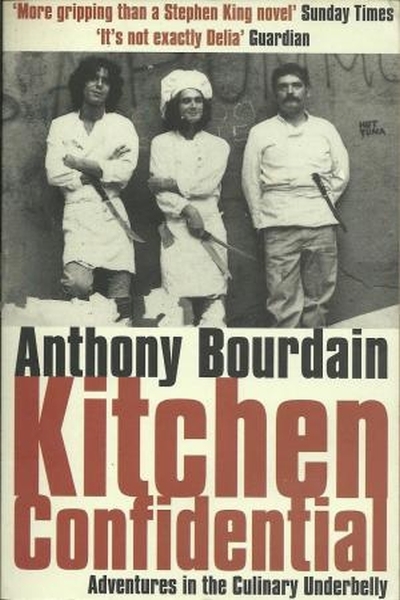 Photograph: Cover of Anthony Bourdain’s book, Kitchen Confidential Adventures in the Culinary Underbelly, published by Bloomsbury Publishing. Bourdain is on the far left.